Dr. Pierce’s interest in the neuropharmacology of drugs of abuse began while he was an undergraduate student at the University of Kentucky. Working with Dr. Michael Bardo in the Psychology Department, Dr. Pierce studied the effects of amphetamine on the mesolimbic dopamine system. He continued to pursue his interest in the effects of psychostimulants on brain dopamine systems through graduate school at Indiana University, where he worked with Dr. George Rebec. Dr. Pierce received post-doctoral training from Dr. Peter Kalivas at Washington State University. Their work indicated that glutamate, in a complex interaction with limbic dopamine, plays an important role in both the development and long-term expression of behavioral sensitization to cocaine, an animal model of addiction. Dr. Pierce established an independent laboratory in the Department of Pharmacology at Boston University School of Medicine in 1997. 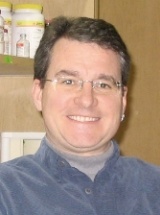 Dr. Pierce joined the Department of Psychiatry’s Center for Neurobiology and Behavior in October 2008. Currently, there are no effective therapies for cocaine addiction, which directly affects over two million people in the United States alone. This reality is the driving force for Dr. Pierce’s research program. The major hurdle for abstaining from abuse of cocaine is intense drug craving, which can be triggered months and even years following the cessation of drug use. The most widely accepted model of craving in animals involves self-administration followed by extinction and the subsequent reinstatement of drug seeking. Using this animal model, Dr. Pierce’s research team pursues a strategy to identify novel neurobiological adaptations produced by cocaine. This information then can be used to formulate potential cocaine addiction therapies. Kumaresan Vidhya, Yuan Menglu, Yee Judy, Famous Katie R, Anderson Sharon M, Schmidt Heath D, Pierce R Christopher: Metabotropic glutamate receptor 5 (mGluR5) antagonists attenuate cocaine priming- and cue-induced reinstatement of cocaine seeking. Behavioural Brain Research 202(2): 238-44, Sep 2009. Famous Katie R, Kumaresan Vidhya, Sadri-Vakili Ghazaleh, Schmidt Heath D, Mierke Dale F, Cha Jang-Ho J, Pierce R Christopher: Phosphorylation-dependent trafficking of GluR2-containing AMPA receptors in the nucleus accumbens plays a critical role in the reinstatement of cocaine seeking. The Journal of Neuroscience 28(43): 11061-70, Oct 2008. Vassoler Fair M, Schmidt Heath D, Gerard Mary E, Famous Katie R, Ciraulo Domenic A, Kornetsky Conan, Knapp Clifford M, Pierce R Christopher: Deep brain stimulation of the nucleus accumbens shell attenuates cocaine priming-induced reinstatement of drug seeking in rats. The Journal of Neuroscience 28(35): 8735-9, Aug 2008. Anderson Sharon M, Famous Katie R, Sadri-Vakili Ghazaleh, Kumaresan Vidhya, Schmidt Heath D, Bass Caroline E, Terwilliger Ernest F, Cha Jang-Ho J, Pierce R Christopher: CaMKII: a biochemical bridge linking accumbens dopamine and glutamate systems in cocaine seeking. Nature Neuroscience 11(3): 344-53, Mar 2008. Famous Katie R, Schmidt Heath D, Pierce R Christopher: When administered into the nucleus accumbens core or shell, the NMDA receptor antagonist AP-5 reinstates cocaine-seeking behavior in the rat. Neuroscience Letters 420(2): 169-73, Jun 2007. Schmidt Heath D, Pierce R Christopher: Systemic administration of a dopamine, but not a serotonin or norepinephrine, transporter inhibitor reinstates cocaine seeking in the rat. Behavioural Brain Research 175(1): 189-94, Nov 2006. Schmidt H D, Pierce R C: Cooperative activation of D1-like and D2-like dopamine receptors in the nucleus accumbens shell is required for the reinstatement of cocaine-seeking behavior in the rat. Neuroscience 142(2): 451-61, Oct 2006. Anderson Sharon M, Schmidt Heath D, Pierce R Christopher: Administration of the D2 dopamine receptor antagonist sulpiride into the shell, but not the core, of the nucleus accumbens attenuates cocaine priming-induced reinstatement of drug seeking. Neuropsychopharmacology 31(7): 1452-61, Jul 2006. Schmidt Heath D, Anderson Sharon M, Pierce R Christopher: Stimulation of D1-like or D2 dopamine receptors in the shell, but not the core, of the nucleus accumbens reinstates cocaine-seeking behaviour in the rat. The European Journal of Neuroscience 23(1): 219-28, Jan 2006.